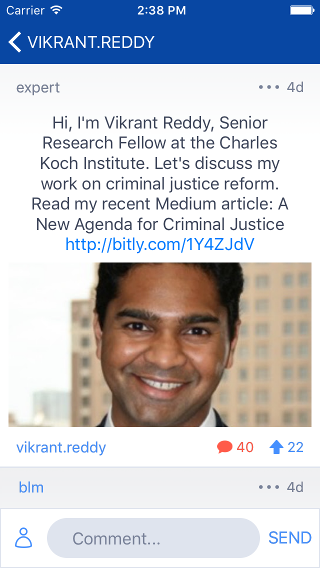 Vikrant Reddy, Senior Research Fellow at the Charles Koch Institute, joined us Thursday, June 2 to discuss his work on criminal justice reform. Read his essay "A New Agenda for Criminal Justice Reform" on Medium. @broughton.fowle: Thanks for joining us! What change to the system would most reduce mass incarceration? Drug policy/mandatory sentences? The key to reducing our high levels of incarceration is captured in this pithy line: “Prison is for people we’re scared of, not people we’re mad at.” If a person can be held accountable using community supervision – parole, probation, drug courts, etc. – we should do that as often as possible. The important thing is to make sure public safety is prioritized. Don’t create systems wherein people come out of prison more dangerous than when they went in. @blm: Hi Vikrant and thanks so much for your work on this issue. Do you ever run into ad hominem attacks against your efforts on the basis that you're funded by the Koch brothers? Well, just to be technically clear. I only work for one of the brothers – Charles. All of us work for people in the public eye, and all of our bosses receive ad hominem attacks from time to time. I ignore them as I assume all of you do! This sort leads into another question I was asked, though. What is Mr. Koch’s interest in the issue? In short: public safety, costs, and human dignity. These are all core elements of classical liberal (or “libertarian”) thinking. The Charles Koch Institute is an educational organization, and our job is to educate people on these important issues. @leahy.colhoun: What are your top sub-issue areas in criminal justice reform? Ie What are the priorities? Our priority issues are: policing, civil asset forfeiture, overcriminalization, sentencing and corrections, and collateral consequences. @locke.bell: What's your response to the black lives matter movement as it relates to reform? Black Lives Matter is interesting. I’m not sure I agree with all their positions or tactics, but I understand the frustrations many Americans have with policing right now. For example, the DOJ report on Ferguson revealed that nearly 20% of the city’s budget came from fines and fees charged to the city’s residents. It’s not just a small-town problem. In Chicago, 15% of the budget came from fines and fees. These cities are balancing their budgets on people’s backs. Conservatives and libertarians have been criticizing things like this for ages. So, it seems like a potential area for bipartisan cooperation. Here’s another thought. Several years ago, we started passing laws that said you couldn’t sell drugs within X feet of a school zone or else the penalty would be enhanced. Laws like this never affected my life because I went to public schools in suburban Fort Worth, and my schools were surrounded by green fields. If, however, you went to school in Baltimore, New York, or Chicago your school was probably located in the middle of an urban city street where people lived, worked, and shopped. People selling drugs may have had no idea that there was a school a block away – but the penalty on them was still ratcheted up. The law wasn’t passed with race in mind, but there’s no doubt that it had a different racial impact depending on whether you were in the suburbs or an urban environment. @congressionaldm: New Jersey uses a drug court system that diverts first time, low level drug offenders from the rest of the criminal justice system. How do you feel about the existance of separate drug courts, and do you think they would be as effective on a federal level? What would it take to get something like this more relevant in the national conversation? Thanks for doing this! Drug courts aren’t perfect – nothing is – but I feel pretty good about what they have accomplished so far. In my home state of Texas, we decided to spend $240 million on better parole, probation, and drug courts rather than $2 billion on new prison beds. Six years later, Texas had actually closed three prisons. Meanwhile, its crime rate, which had fallen for years, continued to fall – and dropped to its lowest point since 1968. @sam.ward: Where do you see more chance of reform: changing sentencing on the front end for how we send people to prison, or reform on the backend for voting rights and incorporating criminals back into society? I hate to distinguish because BOTH are important. A friend of mine who is a state legislator, however, offers a pretty good answer. He says that he thinks of our prisons like a pipe that is about to burst. You can either slow down the rate of what comes in – or you can increase the rate of what goes out. He thinks the former approach is more practical, politically speaking. But again, BOTH are important. @cameronpig: Hi! What are your thoughts on Chairman Goodlatte's "criminal justice reform buckets?" Did he achieve his purpose of the first steps for reforming the system or do you think it was grandstanding? I think the conversation started because people on the Right started to pay attention to the issue. Fiscal conservatives were concerned about the costs. Social conservatives were concerned about redemption and broken families. Libertarians were concerned about the Orwellian image of so many of our fellow Americans in cages. All these groups were concerned about high recidivism rates and public safety. At the state level, in particular, these concerns really started coming to a head around 2006. Since then, “red states” like Texas, South Carolina, Georgia, South Dakota, Alaska, and Utah – and many more -- have passed some very strong reform bills. @rep.targaryen: What do you think the odds are of seeing comprehensive criminal justice reform passed in both chambers this Congress? I don’t know if we will have federal reform this year, but I know we will have it eventually because Congress will follow the leadership provided by the states. Just this year alone, Florida, Virginia, New Hampshire, Maryland, Oklahoma, and many other states have passed important reform legislation. Justice Brandeis famously said that the states were laboratories of Democracy that needed to learn from each other. Well, Congress needs to learn from the laboratories too! @broughton.fowle: That's another problem - making criminals more dangerous through incarceration. When prisons are private, what incentive is there for costly rehabilitation? I get asked about private prisons frequently, but only about 10% of prisoners are in private facilities. Around 90% are in public facilities, and interestingly, in these public facilities you tend to find that prison guard unions will lobby for increased incarceration. In 1994, when California passed “three strikes,” the state’s prison guard unions lobbied in support of the bill – unsurprisingly. We will always have prisons, and that means that there will always be incentives to increase incarceration among those who staff and manage the prisons, regardless of whether they are public or private. It’s up to all of us to recognize the incentive problems and focus instead on smart policy. In Texas, the three facilities that were shut down in 2011 and 2013 were private. It’s usually easier to shut down a private prison than a public one. @toucey.mccomas: Some backup the argument for the legalization of marijuana with the notion that it would help with overcrowding in prisons. Do you support the legalization of marijuana? Do you think the impact of legalization on overcrowding would be significant? There are marijuana offenders in our prisons, but not quite as many as we sometimes think. (Take a look at this piece that I wrote for National Review about the reality who is and is not in prison: http://www.nationalreview.com/article/435556/criminal-justice-reform-facts.) There are plenty of drug offenders, though, and we probably need to focus more on treatment on rehabilitation for them. When you have a chemical addiction, and you sit in prison cell, it doesn’t really address the chemical addiction. @cameronpig: Do you think popular media has played a role in our treatment of criminals? Especially with the advent of cable news: car chases, true crime stories, 24-7 in your face bloodshed. I could even throw Maury and Springer into this lot. It's as if the public wants to shame their criminals. I hadn’t thought about the pop culture angle, but you might be on to something. (We hosted a conversation on this topic among some prominent media members last November: https://www.charleskochinstitute.org/criminal-justice-the-press-a-conversation/.) You are certainly right that shame is a big part of our criminal justice system – and often in counter-productive ways. There are all sorts of collateral consequences that stem from conviction – the inability to get a job, get an occupational license, find a home, etc. – and these consequences don’t really help improve public safety. Capitol Bells, Inc. is the startup behind the Congressional apps Capitol Bells and Cloakroom. Tap into democracy!